Please note that the content of this book primarily consists of articles available from Wikipedia or other free sources online. 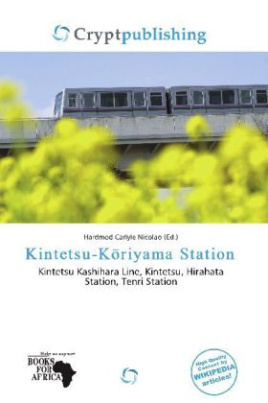 Kintetsu K riyama Station is a station on the Kintetsu Kashihara Line in Yamatokoriyama, Nara Prefecture, Japan. Kintetsu Corporation, named Kinki Nippon Railway Co., Ltd. in English until June 27, 2003, is a Japanese rail transit corporation commonly known as Kintetsu. It is the largest non-JR railway in Japan. Its complex network of lines connects Osaka, Kyoto, Nara, Nagoya, Tsu and Ise. Kintetsu also operates tourism, real estate, and shipping companies, and has a major rail car-building operation that produces trains used in Japan, the United States, Egypt and Hong Kong.